Image selected from web. I think that's the cover of the copy I read years ago. Dr. Paige Taylor: She swore it was euthanasia, but when Paige inherited a million dollars from a patient, the D.A. called it murder. Dr. Kat Hunter: She vowed never to let another man too close again-until she accepted the challenge of a deadly bet. Dr. Honey Taft: To make it in medicine, she knew she'd need something more than the brains God gave her. Racing from the life-and-death decisions of a big major hospital to the tension-packed fireworks of a murder trial, Nothing Lasts Forever lays bare the ambitions and fears of healers and killers, lovers and betrayers. I don't think this is the first time I am reading Nothing Lasts Forever. I have a feeling I read it before as the story was quite familiar but I just couldn't remember it. If I read it, it must be before I started this blog as it wasn't reviewed so I guess it's quite okay... to re-read it I mean. 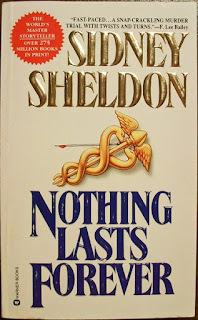 It is still pretty much enjoyable to read this again (that is if I read it before) as story wise, it wasn't that spectacular but where novels by Sidney Sheldon are concerned, it's the way he wrote it that made them special. This time round, I actually read an e-copy so there's no book cover. I found the above image from the web and I remember reading a few titles that was published as such (most probably in the 90s) and that's probably when I read this particular title. I might even owned a copy at one time but I certainly don't now so I might have given it away. 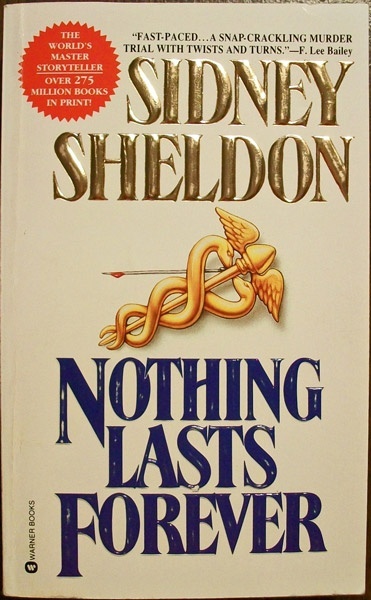 Like most Sidney Sheldon's heroine, the doctors featured are all pretty, capable, strong and vulnerable. It's pretty much a successful formula and certain delivers when you're looking for an entertaining read. Anyway, it was great to read this again and this post better be a reminder so I don't forget about reading it.